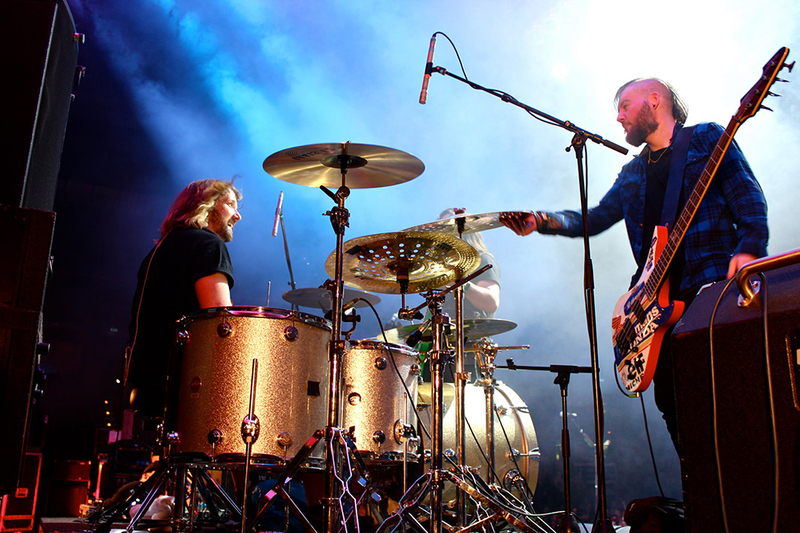 Seether, a multi-platinum alternative metal band from South Africa, is back with their first all-new album since 2011. Since its beginning in 2002, the band has had a hard time getting back in the studio because of their nearly constant touring. Isolate and Medicate, Seether’s sixth studio album, was released on July 1 and delivers a lyrically strong and musically diverse set list. The group has lived up to, if not surpassed, their former chart toppers like “Fake It,” “Rise Above This” and “Broken.” Seether – including band members Shaun Morgan (lead vocals, guitar), Dale Stewart (bass, backing vocals) and John Humphrey (drums) – is now touring as part of the Rockstar Energy Drink UPROAR Festival until Dec. 17. The band has been on fire in the tour arena. In May, they hosted the second annual Rise Above Fest Concert Tour alongside heavy metal staple, Avenged Sevenfold. They founded the tour to raise awareness for the world’s teen-suicide epidemic and to supply funding to the National Alliance on Mental Illness. Front man Morgan was inspired to begin the tour after his brother took his own life in 2007. The tour is titled after their second consecutive #1 song on the U.S. Modern Rock chart, “Rise Above This.” The band confronts the issues head on through their lyrics and now bring attention to the cause on a larger scale. Many of the lyrics featured in Isolate and Medicate were taken directly from Morgan’s personal journals. In a Loudwire interview, Morgan explained that “if it makes me angry enough or sad enough, I’ll write about it. It’s the happy stuff that I feel that I don’t want to get rid of.” The album has a darker theme to the lyrics but is balanced with upbeat guitar riffs. The lead single, “Words as Weapons,” hit #1 on Active Rock Radio chart within the first week; the song deserves all the praise. Morgan slowed down the tempo and showcased his vocal talents then slipped seamlessly into a harder sound. It’s a melodious balance between anger and desperation. “Same Damn Life” is another stand out hit that diverts, but does not detract, from Seether’s classic sound. The song is the most mainstream feel they have come out with yet. It includes three distinct parts that many bands would not think to blend, and yet Seether managed to merge them flawlessly. In “Nobody Praying for Me,” Seether showcases their lyrical prowess alongside reverberating harmonies. The verses are built from intricate metaphors – a compilation of all-consuming destruction, decay and sacrifice. Morgan pitches deep vocals until he hits the first note of the chorus. In stark contrast to the feeling of despair from the first verse, the chorus begs you to stand up and fight (or at least rock out). Throughout the album, Seether expresses a vamped up version of themselves. They manage to give the old Seether sound in a different way each time and with each song. The deluxe version of Isolate and Medicate is now available for purchase and features four more unforgettable songs entitled “Turn Around,” “Burn the World,” “Goodbye Tonight” and “Weak.” The album is worth listening to on repeat. Spotify it. Get it on iTunes. YouTube it. Just get it.